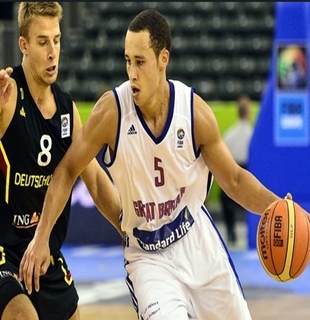 Great Britain improved their chances of advancing to the second round of the EuroBasket Men 2013 after scoring a huge 81-74 win over Germany on Sunday in Slovenia. Andrew Lawrence spearheaded Great Britain’s offensive attack with his 23 points on 7-for-10 shooting from the field, while Myles Hesson posted 21 points to go along with 11 rebounds. “It was a hard fought win. We really needed it. I’m really proud of the way everyone stepped up today. I’m really proud of everyone,” said Lawrence, who went 4-for-4 from beyond the arc in the game. Great Britain started out slow and went down by 10 points, 23-13, in the opening period, but they took advantage when Germany became complacent. After trailing by seven points heading into the second period, Great Britain rallied in the second quarter to take a 42-38 lead at the half. The two teams went toe-to-toe in the second half, but Great Britain showed tremendous composure until the final buzzer sounded. “I thought we did a great job on keeping them in check. On the offensive end, we got a lot of positive contributions from a lot of people. We had just seven turnovers which is a great effort. Andrew played his best game shooting well, and showing some great defense. Myles Hesson was great again. And Dan Clark played extremely hard, drawing a lot of attention out on the floor,” said Great Britain coach Joe Prunty after the game. Great Britain will look to formalize their entry to the second round and improve their position as well when they go up against Ukraine in the final day of the preliminary round on Monday.